This time, we're TRIPLING your winnings, by introducing you to three hosts on CFCR's amazing roster of volunteers. One of CFCR's longest-running programs is Third Verse (Wednesdays, 9-10:30pm), which is a show devoted to both kinds of music: Hip and Hop. Taking two from the first, and last from the worst (you'll have to ask them what that means exactly) since 1997, the show has seen a rotating cast of hosts over the years, with the current lineup featuring Mark Charmbury (aka Chaps, who has been with Third Verse for most of its entire existence! ), Chris Jarvis (aka Chapter Thrive), and Kent Ness (aka Rewind). These three wise dudes (Happy Holidays!) bring you a variety of hip-hop each week, from the latest jams from Kendrick Lamar, to classic Wu Tang tracks, to the freshest rhymes recorded just around the corner in Saskatoon. Not only are they great on-air personalities, but these guys have also become venerable fundraising champions, bringing in over $1900 for CFCR's recent FM-Phasis funding drive. They were also eager volunteers at our events, including one at The Captiol Music Club, where Chapter Thrive performed as part of the Hustle & Thrive hip hop duo (with fellow CFCR host, DJ Charly Hustle), and Rewind & Chaps worked the front table, hustling for station donations. Kent: I first heard of CFCR through hearing about the Third Verse program, likely through a friend; sometime in high school (around 2001?) I used to record the program to tape and listen back to it during the week as a way of discovering music. This was back when Chaps was the primary host. Chris: When I first came to Saskatoon, I eventually ended up making a few connections by going to rap shows, and one of the first people who introduced himself to me, standing in the back row, was Chaps. When I made my first album in 2007, Chaps hit me up and asked if I wanted to play some of my music on the air on his show on CFCR, so I obviously accepted his offer! I remember the old station room and Nolto was the co-host back then, and I think Factor as there too. It was kind of a harrowing experience, because I looked up to these guys since high school, and playing some of my own beats for Factor was really intimidating! Chaps: The first signs I ever saw of CFCR were of a sticker in a high school locker in the early 90s and it peaked my curiosity. I became an avid listener of two show shows in 1994. Paul Kell’s show The Crack House and Joss Ives (Knowskills) show Trunk of Funk: The Vinyl Frontier (Interesting tidbit, Paul Kell went on to direct the hip-hop documentary released in 2003 called 5 Sides of A Coin). Joss’s show was my favourite it was on Sunday nights, I believe at midnight, and I religiously stayed up every Sunday night to listen, which made for some tired Monday high school mornings. I really liked it because it was one of the only outlets to hear the music that I was passionate about and it exposed me to a lot of new music. This is what makes Community Radio so magical and important. I became friends with hosts Knowskills through Epic and soon found myself in the studio in the fall of 1996 slowly contributing tracks and then becoming a full time co-host as we changed the name to Third Verse in 1997. Kent: I was excited to be asked to join the show as it was something I grew up listening to and learned a lot from; at this point it's just become part of my weekly routine though. I enjoy getting the chance to play music I enjoy that you won’t hear anywhere else on the radio. CFCR is the only station in the city with a true variety; the only station with a heart and soul. The music and shows are curated by people who care about the music and topics they discuss; not generated according to corporate interest or anything else. Chris: There are a lot of interests out there that are foundations to a lot of the culture and society and I think Community Radio is a great platform to allow people with their eclectic interests and tastes to make them available to the world. As well it gives legs to the local scenes to maintain history and longevity. I don’t think saskatoon’s hip hop scene would be what it is without Third Verse. Chaps: Third Verse became the rallying point for the hip hop community through the late 90’s and early 2000’s. It became more than a show and a place where we could share music, ideas, interests and was quickly becoming the social event of every week with a cast of contributors and characters. It played an important part in formulating a supportive open and creative hip hop scene in Saskatoon as DJs Knowskills, Epic, Innate, soso and Factor and myself became weekly contributors. 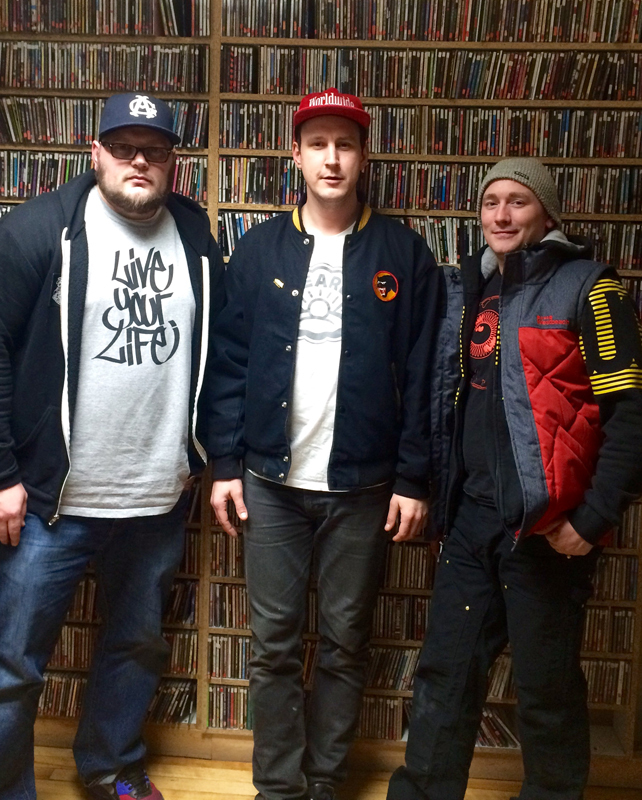 It continues to be a foundation within the Saskatoon hip hop scene, and has expanded its listenership worldwide. Community radio builds community and that is why I continue to volunteer. In addition, I love discovering new music and sharing those discoveries with the listeners each week. Kent: We get interesting callers every now and then, but nothing too crazy ever happens. We've definitely had some "big" artists come through the studio and give us interviews, which are always exciting; Kutmasta Kurt came through a few years ago and hosted a whole show with us; that was pretty crazy. Chris: One time, Chaps and I trolled Kent so hard he believed us. Chaps: Lots of craziness over the years, but one of the more crazy things we did on the air was play Necro’s X-Mas Freestyle from his album Gory Days affectionately known as “Merry Crucifixion” on Christmas or Christmas eve in 2000. Not the best idea but we survived it. Chalk that one up to being young and dumb. On a more positive note one of my all-time favorite shows we did was Christmas 1996 as we did a live mix DJ show for four hours on Christmas night. Kent: Shows I catch and enjoy on a weekly basis are: Expansions with Dr. J and Green Eggs & Ham on my morning commute. Chris: Wednesday Hot Buttered Soul. Shouts to young Charly Hustle; always the best with the vinyl playlists! Chaps: There is a lot of really quality programming on CFCR but Tin Cans and Twine is the best show on CFCR in my opinion. Shoulder Crow is the best co-host in the business! Love that show! Kent: Local: Shooting Guns. Non-local band: Ceschi. Chris: Locally, I will try to never miss a Kay The Aquanaut show. Best live performer here. Outwardly, I will always list Moka Only at the top of my list, but Kendrick Lamar’s back catalogue and affiliates are really winning overall in my books. Chaps: So many talented bands, rappers, musicians, and singers in Saskatoon, but Economics is my favourite. His album The Wastes is incredible from start to finish and he puts on a really great live show. Shout outs to soso, Maybe Smith, Carbon Dating Service and Pearson!! As far as non-local goes, too many to mention but my all-time favourite rappers are Awol One and Masta Ace. Kent: Too many hobbies; not enough time. Chris: I generally spend my time building things out of wood and construction materials, record samples and witty anecdotes. I also enjoy fending off dastardly space faring races from attacking and destroying the last bastion of humanity. Chaps: I love everything baseball related. Playing, watching, reading, talking, and collecting. Like rap music, I can’t get enough! Kent: Favorite: anything that belongs on a pizza. Least: anything that doesn't belong on pizza, like artichokes. Chris: Gotta be fine, Italian pepperoni. Also, get that corn outta my face! Chaps: Favourite: pineapple. Least Favourite: potatoes. Kent: Books: Not much of a reader. Shows: Peep Show, Aqua Teen Hunger Force, Tim and Eric. Movies: Style Wars, Who is Bozo Texino? Chris: TV show? Hands down westworld. Incredible. Book? I really enjoyed So Good They Can't Ignore You by Cal Newport and The Coldfire Trilogy by CS Friedman is boss. Chaps: Best book is Jonathan Mahler’s Ladies and Gentlemen, The Bronx is Burning; 1977, Baseball, Politics, and the Battle for the Soul of a City. Great insight into 1970s New York and the conditions that were present that birthed the creation of Hip Hop through baseball and politics. It is fascinating! I have to give a huge shout out to Theo Kivol (former CFCR Program Director) who was really supportive of Third Verse in the early years and allowing us to push the boundaries of what a radio show could be and for not cancelling our show due to our crazy shenanigans. Devin The Dude: "Lacville 79"
Eyedea and Abilities: "This Story"
NxWorries (Anderson.paak and Knxwledge): "Get bigger/do u luv"
Danny Brown ft Kendrick Lamar, Ab-Soul, Earl Sweatshirt: "Really Doe"
Kay the Aquanaut and Maki: "Red and White Leaves"
Milo: "Song About A Raygunn (An Ode To Driver)"